Apple has revealed its new iPad Pro 12.9-inch retina display which deliver high end performance like PC. The iPad Pro which resembles a large iPad Air in Design, also resolution of 2732 x 2048, which is 5.6 million pixels – more than any apple iOS devices and higher than MacBook Pro with Retina display for high end Graphic Performance. The New iPad Pro will be powered with 64-bit A9X processor which is 1.8 times faster in performance when compared to A8X Processor in iPad Air 2, with up to graphic twice as fast. It is also said that tablet would have 80% faster performance and 90 percent faster graphics over portable PCs and with iOS 9 allowing it multi-tasking capability to the tablet, allowing users to run apps at 60 frame-per-second for better Performance and entertainment. The iPad Pro measures 6.9mm thick and weighs 1.57 pounds, making it thin and light enough to be taken anywhere, also featuring with four–speaker audio system for better and balanced sound quality three times the audio level of the iPad Air 2. 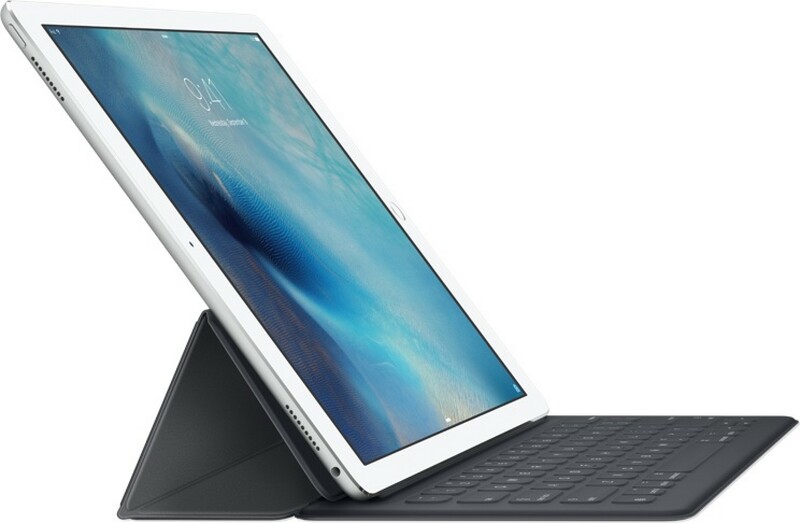 Apple also introduced two accessories for the iPad Pro, Smart keyboard connects to the iPad Pro via a new magnetic port called the Smart Connector, which can transmit both data and power at the same time, as it connects directly to the iPad Pro, the Smart Keyboard does not require a separate battery, on/off switch, or Bluetooth pairing – it just snaps on to it and it works automatically with a capability of working with the QuickType features in iOS 9 for better typing experience. The second accessory that accompanies the iPad Pro is Apple Pencil, a stylus having technology that can detect position, tilt and force to enable pressure sensitivity. Apple pencil allows artists to touch a single pixel and calculate angle and orientation to produce at shaded strokes. The Pencil’s battery lasts for hours and that it can charge by connecting to the iPad Pro’s Lightning charger. Apple Pencil will retail for $99 while the Smart Keyboard will retail for $169. Both will be available alongside the new iPad Pro. Apple will also sell Smart Covers and Smart Cases designed for the iPad Pro. The iPad Pro launches in November in Silver, Space Gray and Gold, starting at $799 for a 32GB Wi-Fi only model. A 128GB Wi-Fi only model will cost $949 and a Wi-Fi + LTE 128GB model will cost $1,079 and will be available in November.